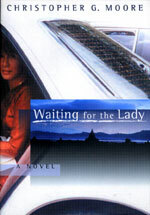 The latest book from Bangkok based Christopher G. Moore is a novel, Waiting for the Lady (ISBN 974-90755-6-0). Published by Heaven Lake Press this year, it was received for review in hard cover format, but will be available later in paperback. The book begins with the main character, Sloan Walcott, somewhat of a ‘soldier of fortune’ finding a camera in Rangoon Airport. That camera had an unfinished roll of film inside, which on processing was found to have 18 shots of the Burmese dissident (and democratically elected leader) Aung San Suu Kyi, plus an enigmatic shot of a young woman with a tattoo on one thigh. How these come together and their true meaning, takes you firstly on a trip from Bangkok to Rangoon. Walcott does not have the totally cynical character that Vincent Calvino, the main character in many of Moore’s other books, portrays. However, a man who finds that his wife has carefully filled his shoe with doggy doo for his 52nd birthday is entitled to a fair degree of scepticism. However, Walcott perhaps deserved his doggy insole for demonstrating his almost total lack of soul. After a meeting with the Lady, the tale moves on through Burma, delving deeply into the past and the Japanese involvement in Burma in WWII. Graphic scenes of war bring out the emotion and pathos in those who become embroiled in it. The ending is powerful, with the message that history is what you make of it, depending upon the veracity of those who wrote it. This book is on sale in all major book outlets, with Bookazine having it on the shelves at 895 baht for the currently available hard cover printing. If you have not read any of author Moore’s previous books, you will quickly become a fan after reading this one. I continue to be enthralled by Moore’s narrative, and the way he can quickly set the mood for any scene. He describes people you “know” and you tend to turn the pages wondering if you will read yourself on the next one! I am convinced I have eaten at the Floating Balls noodle stand, well if not, one run by the same family. Moore has a great sense of humour too, with the scene where Sloan and his side-kick Hart tour the Drug Elimination Museum in Rangoon, producing guffaws as I read through the constant parade of one-liners and rejoinders. Moore is an intellectual writer, with some deep sociological views that gleam through the pages. In a passage describing the deaths of student dissidents in Burma, he writes, “Such idealism is a genetic dead end. It rarely gets transmitted to the next generation.” Indeed, just where are the sons of yesterday’s protest movements? Christopher G. Moore is an author who can conjure up a plausible story to keep you reading his books till the last page. Waiting for the Lady is no exception to this. A great read and a book that I am happy to have on my shelf too. You’re not getting the review copy back, Christopher! Even if you send Calvino over. Camel was formed in late 1971, when veteran keyboard wizard (previously with Rod Stewart in “Steampacket”, Peter Green and Mick Fleetwood in “Peter B’s Loonies”, and Van Morrison in “Them”), Peter Bardens joined forces with power trio “The Brew”. Their third album, ‘The Snow Goose’, really established the band as a force to be reckoned with. Released in 1975, after the first two albums had been released to great critical acclaim but very weak sales, leaving the band scratching their proverbial heads wondering in which direction to go. Nobody would have put money on a forty minute instrumental covering both sides of the vinyl record based on Paul Gallico’s short story ‘Snow Goose’. But The ‘Snow Goose’ turned out to be The Golden Goose as it rocketed up the charts on both sides of the Atlantic. By the end of 1975, Camel had been voted brightest hope by Britain’s prestigious weekly rock journal Melody Maker. There followed two equally successful follow-up albums. Only this time both albums had some vocals on them. (‘Moon madness’ in 1976 and ‘Rain dances’ in 1977). It was on the ‘Rain dances’ tour that most of this live album was recorded. Five of the first seven songs on this CD are from that album, and were not released at the time because of their similarity to their recently released studio versions. But with this digitally re-mastered double CD they have been faithfully restored, and a wonderful addition they are too. By 1977 Camel had really got into their stride (don’t get the hump - no pun intended). Original bass player Doug Ferguson had left the band acrimoniously before the recording of ‘Rain dances’ and was replaced by the musically superior Richard Sinclair, previously with Canterbury Prog Rockers ‘Caravan’. With Sinclair’s whimsical voice to go with the Camel songs, it was a match made in Rock ‘n’ Roll heaven. Legendary wind instrumentalist Mel Collins, who had joined the band in the studio for the recording of the last album, decided to join them on the road, augmenting the sound further with wonderful flourishes from his saxophones and flutes. Collins declined an offer to join the band full time as he preferred to keep his options open for his very lucrative session work. However, he satisfied his road dog emotions by touring with Camel right up until 1981. Although all of the songs on this collection are recorded live, they are not all from the same concert. In fact, they are not even all from the same year or line-up. The songs kick off with nine from the ‘Rain dances’ tour with Sinclair and Collins on board. Then we are whisked back to 1974 for two epics (‘Lady Fantasy’ is nearly fifteen minutes long) recorded at the Marquee in pre Snow Goose days. But the real feather behind this Camel’s ear is on disc two, which includes the whole of ‘Snow Goose’ recorded by the Virgin mobile studio at a memorable concert with the London Symphony Orchestra at London’s Royal Albert Hall on October 17th 1975, with David Bedford taking up the conductor’s baton in a version of Camel’s Magnum opus that even exceeds the studio version. The music is then brought to a close by two fine numbers from 1976. In all, nearly three hours of sumptuous music. So what happened? I hear you ask. Unfortunately this Camel does not really have a happy ending. Within one year Peter Bardens had left the band, citing musical differences. (Tragically Peter Bardens died of cancer in January of 2002, following a distinguished solo career.) After one more tour Richard Sinclair was asked to leave the band, and later Andy Ward would succumb to alcoholism, being unable to cope with life on the road. Original bass player Doug Ferguson never re-joined the music industry, such was his disillusionment with the whole business side of things, while Andy Latimer still carries his guitar in the dromedary cause to this day leading his herd down the rocky road of Progressive Rock.